52 • ROCK products • March 2019 www.rockproducts.com COMMUNITY RELATIONS Thomas J. Roach, Ph.D., has 30 years experience in communication as a journalist, media coordinator, communication director and consultant. He has taught at Purdue University Calumet since 1987, and is the author of "An Interviewing Rhetoric." He can be reached at thomasjroach@gmail.com. Probably because we communicate all the time, we have the illusion that communication objectives will be addressed naturally as opportunities present themselves. However, communication is like any other professional responsibil- ity, if it is to be done well, it needs a plan with a timeline and a budget. 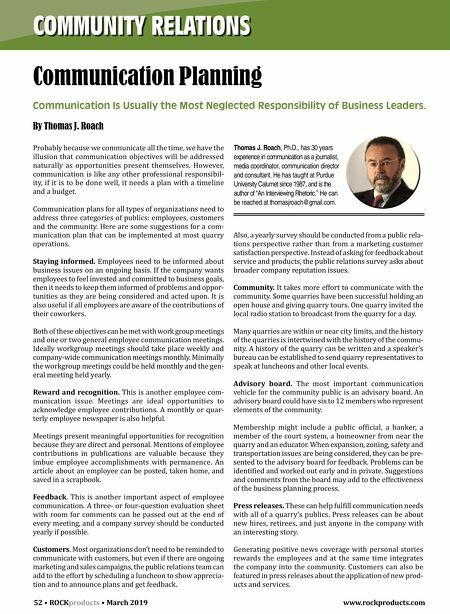 Communication plans for all types of organizations need to address three categories of publics: employees, customers and the community. Here are some suggestions for a com- munication plan that can be implemented at most quarry operations. Staying informed. Employees need to be informed about business issues on an ongoing basis. If the company wants employees to feel invested and committed to business goals, then it needs to keep them informed of problems and oppor- tunities as they are being considered and acted upon. It is also useful if all employees are aware of the contributions of their coworkers. Both of these objectives can be met with work group meetings and one or two general employee communication meetings. Ideally workgroup meetings should take place weekly and company-wide communication meetings monthly. Minimally the workgroup meetings could be held monthly and the gen- eral meeting held yearly. Reward and recognition. This is another employee com- munication issue. Meetings are ideal opportunities to acknowledge employee contributions. A monthly or quar- terly employee newspaper is also helpful. Meetings present meaningful opportunities for recognition because they are direct and personal. Mentions of employee contributions in publications are valuable because they imbue employee accomplishments with permanence. An article about an employee can be posted, taken home, and saved in a scrapbook. Feedback. This is another important aspect of employee communication. A three- or four-question evaluation sheet with room for comments can be passed out at the end of every meeting, and a company survey should be conducted yearly if possible. Customers. Most organizations don't need to be reminded to communicate with customers, but even if there are ongoing marketing and sales campaigns, the public relations team can add to the effort by scheduling a luncheon to show apprecia- tion and to announce plans and get feedback. Communication Planning Communication Is Usually the Most Neglected Responsibility of Business Leaders. By Thomas J. Roach Also, a yearly survey should be conducted from a public rela- tions perspective rather than from a marketing customer satisfaction perspective. Instead of asking for feedback about service and products, the public relations survey asks about broader company reputation issues. Community. It takes more effort to communicate with the community. Some quarries have been successful holding an open house and giving quarry tours. One quarry invited the local radio station to broadcast from the quarry for a day. Many quarries are within or near city limits, and the history of the quarries is intertwined with the history of the commu - nity. 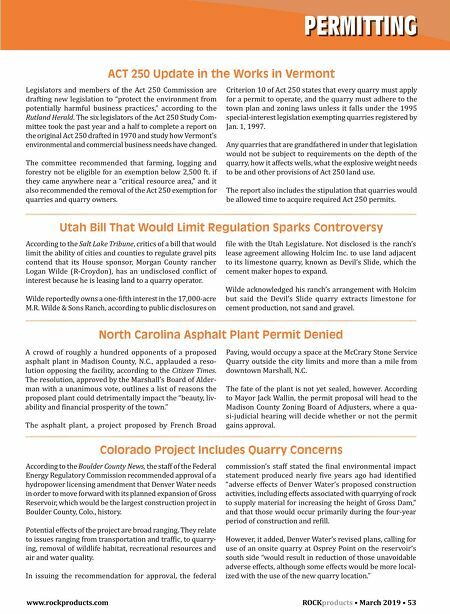 A history of the quarry can be written and a speaker's bureau can be established to send quarry representatives to speak at luncheons and other local events. Advisory board. The most important communication vehicle for the community public is an advisory board. An advisory board could have six to 12 members who represent elements of the community. Membership might include a public official, a banker, a member of the court system, a homeowner from near the quarry and an educator. When expansion, zoning, safety and transportation issues are being considered, they can be pre- sented to the advisory board for feedback. Problems can be identified and worked out early and in private. Suggestions and comments from the board may add to the effectiveness of the business planning process. Press releases. These can help fulfill communication needs with all of a quarry's publics. Press releases can be about new hires, retirees, and just anyone in the company with an interesting story. Generating positive news coverage with personal stories rewards the employees and at the same time integrates the company into the community. Customers can also be featured in press releases about the application of new prod- ucts and services.